We have monkeys, kittens, an old bear and an exciting new cube that can become anything. Let’s have some fun! Teddy Ruxpin Is Back and Better Than Ever! 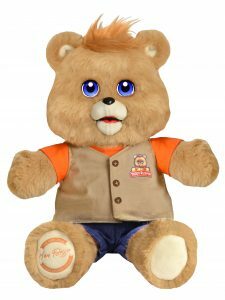 Teddy Ruxpin, the iconic story telling animatronic plush bear from the 1980s is back and smarter, softer and more cuddly than ever. Now with full color LCD eyes, bluetooth technology, advanced touch sensors and an interactive app, the 2017 version of Teddy Ruxpin is ready to play games, tell stories and create magic for a whole new generation of children. Who Doesn’t Love to Monkey Around? Are you ready for the monkey invasion? The grandkids will go crazy for the new Fingerlings Baby Monkeys from WowWee. It’s like having a friend on your finger. These tiny, adorable interactive pet monkeys hold on to your fingers and feature over 40 sounds and animations. Move, touch and speak to your Fingerlings and be rewarded with cute responses, monkey songs, kisses and yes, monkey farts. Do the grandkids want a kitten, but maybe not fully onboard with caring for a live pet? 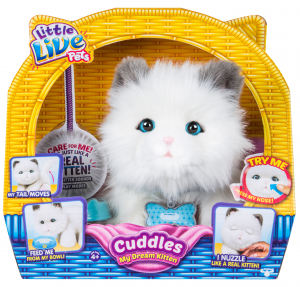 Cuddles My Dream Kitten by Little Live Pets may be just what you need. Cuddles has all the cuteness of a real kitten – she is soft, purrs, blinks her eyes, tilts her adorable head and wags her little tail. The good news for you – no litter box to clean! The Merge Cube may be our favorite gadget of 2017 and it only cost $15! 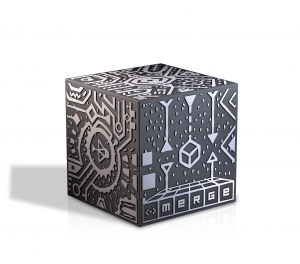 Use your smartphone and Merge apps to bring the Merge Cube to life in Augmented Reality. The foam cube you hold in your hand instantly becomes a tiny city, a solar system, a human skull and so much more. Rotate the cube and watch the virtual objects spin right in your living room. You and the grandkids will love playing with this one.